(Matt) We planned to hike up the "snake path" and so we did. But it's much easier said than done. The books warned us that the hike was steep and difficult... but after Mt. Sinai last night, we felt we could handle anything. We hurried a bit and made the top in 45 minutes, but since my heart rate was 140 and Sam's was 138, we decided to wait for the other guys. I forgot to tell you I kept up with Sam that hike and anyone who has hiked with him knows that he is always first. That is unless Carlson's around burning up the trail. Another note. Sam is first only if a human of the female persuasion is missing. If a girl is tagging along, he hangs out in the back with her - generally. Soos was "Joe Masada" and led us in his quiet way around the ruins. It was quite cool on top because of a very steady and strong breeze. (The bottom, on the other hand, was hot as hell and without a breath of wind.) 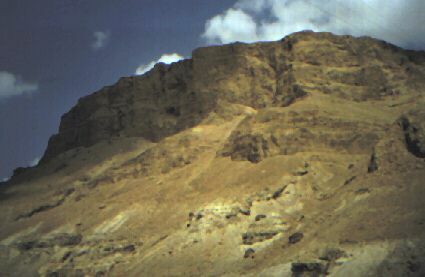 I would give you a good explanation of Masada with a historical perspective but since I'm falling further and further behind, I'll give you a summary and recommend you see the movie ironically named "Masada." 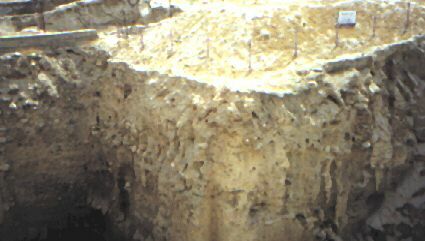 Jews ran there; Romans came; Jews defended; Romans attacked; 900 Jews; 17,000 Romans; 7 months pass; Romans build earth ramp up to gates; Jews commit suicide rather than have their women and children face slavery; Romans walked the deathly silent streets in wonder at what had happened to their valiant opponents. We spent about an hour on top and began the hike back down the mountain (this time Sam and I were in the rear with Chris with is.) 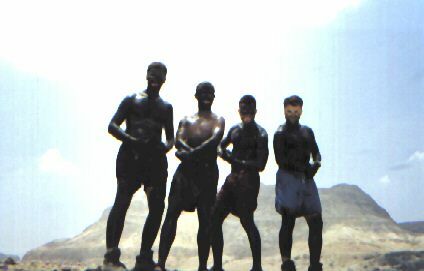 Once we got to the bottom, we wasted no time in making a dash to the Dead Sea on the way to Jerusalem. We stopped at Eingedi. (Sam) We stopped! Then we swam. Well, it was not really swimming. In fact, it was nothing like swimming. It was more like eating a Peppermint Pattie. You could not sink in this watter if you wanted to. 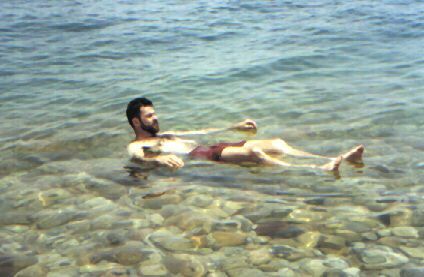 If you stood up in the water, 30% of your body would be perfectly dry. Then we saw the Mud Monsters. The "Weeds" got that gleem in the eye. We headed for the mud pits. (Matt) First Chris and Dave went over while we sat on the water. 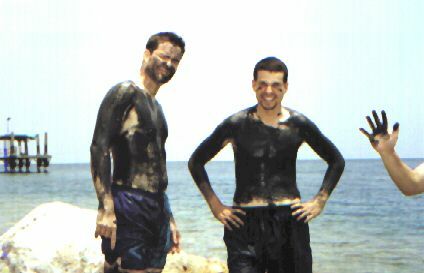 They came back covered (mostly) with black mud. You'll have to see the pictures to believe it. Then the rest of us jaunted over to slather ourselves. It was the first time I have ever done that. I tried many times as a child to smear myself with various substances, including mud, but Mom was always there to protect me from my childish desires. Fortunately, Mom was back home in Indiana and couldn't stop us. On to the Eternal City!! I also gave her the e-mail at Petrine, so maybe... Now back to our story. occupied city in the world. Actually, there was not much of the old place left. The only people silly enough to go there, other than ourselves naturally, were Protestants. I think they all went there because of the Joshua at the Wall of Jericho song. You know the one, where the wall come tumblin' down and all that. Well they knew it and like I said I think that is why they went. On again towards Jerusalem. I don't have much to say about the drive or Dave's driving 'cause I was asleep. We got to the city in early evening and headed for the Jerusalem Inn Hostel. Chris and Greg headed in to check it out and decided to take it. (Primarily, I believe, because the girl running the place, whom we were all to get to know later, was very pretty. Her name, we soon learned, was Einat. NEWS FLASH (6/14 6pm)Tire going flat. Must stop. Must change tire. Must be quick. Greg turning quickly, Soos screwing, car rising, Dave watching - back to our story. (Chris) "E-not" (or Agarat, as we fondly called her) checked us in while we checked her out. We had 2 triples for $18 a head. We had a pretty nice bathroom, clean sheets and towels, and a balcony. We signed on for 2 nights but stayed 3. We then took a walk from this Jerusalem Inn Hostel to find grub. We were in the wrong part of town to get cheap food. All the menus we looked at were about $10 for a meal. Crabbiness was about to set in when we sat down in the Greek restaurant of Riff-Raff. Our waitress was cute and the food was very good. We had pasta, sandwiches, and WAY TOO EXPENSIVE ($4) milkshakes. The bill was too much ($80) and they even overcharged us $2 but since our waitress was cute, we let it go. We did our laundry and hit the hay.